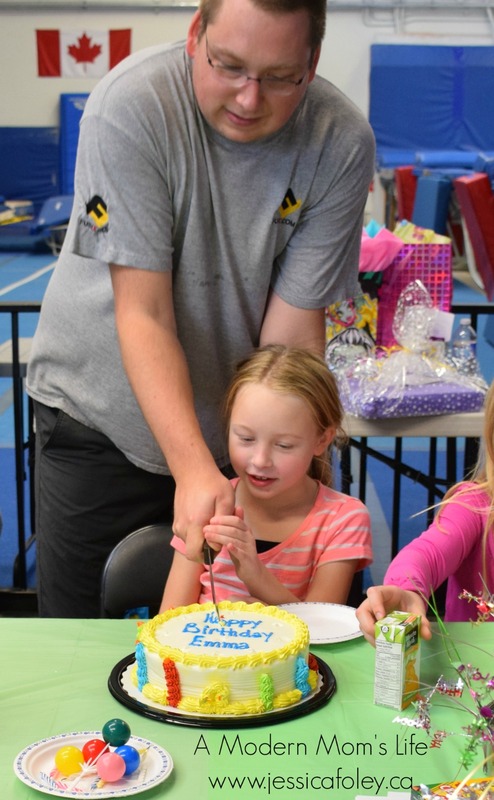 This past Saturday we had a birthday party for Emma at Kingston Aero’s Trampoline Club. Don’t be confused – Emma’s birthday is in Sept but for the past two years we’ve gone to weddings on her birthday weekend. She has no problem having a party at a later date. And this year we chose to try a trampoline party. The trampoline party was also a great excuse to practice some of my photography. (And photo editing skills!) If you’re interested in my photography, check out my page with some other samples of my work. Read on to see a few of the 200 photos I took of the kids. I think the kids had an awesome time at our party. They were all smiles all the time. 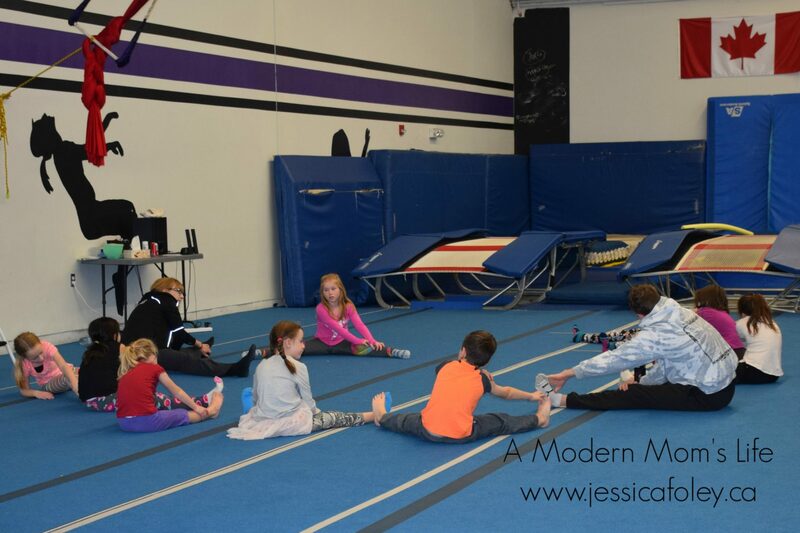 I loved that Melinda (the recreational head coach at the club) ran them through warm ups and the rules of the trampolines. And the kids mostly listened. Then they got to jump around like crazy for an hour. 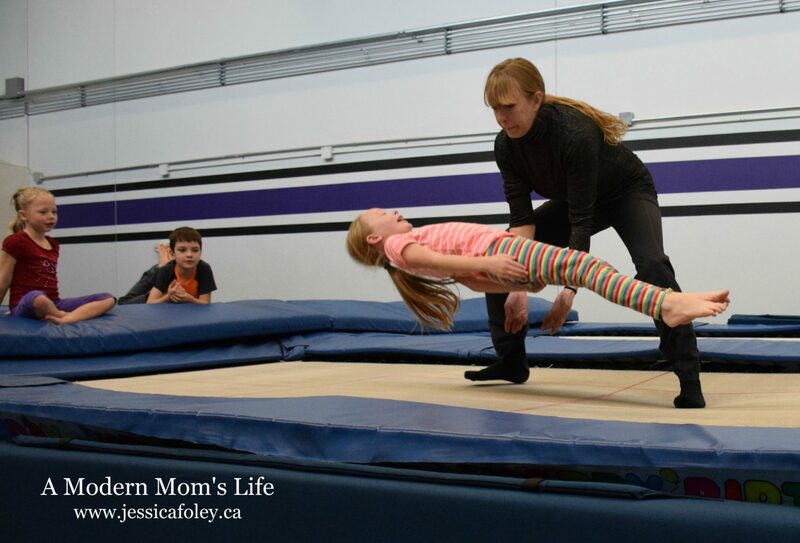 Rose was a natural at the trampoline party business! I made a fun collage of her, and I put a video up on my YouTube page. As the hour was winding down, and the kids were losing interest (some of them anyway) Melinda pulled out this trick. She bounced every kid who wanted to do this. It was a huge hit! Even Mom and Dad got in on the action! 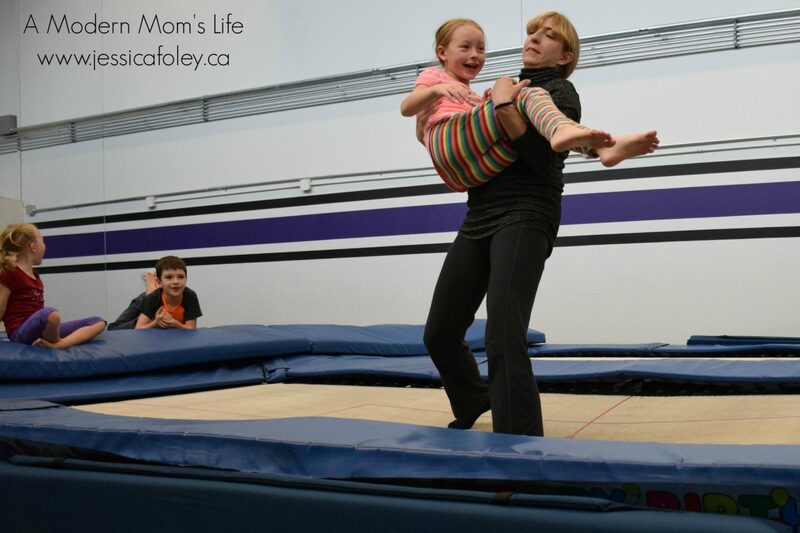 We had a blast bouncing with the kids. After the designated bouncing time is over there’s about an hour for snacks and cake. The kids were starving! We didn’t even bring home any cake – they ate it all! Emma was very excited to have an ice cream cake – she doesn’t like “cake.” I know, she’s weird, right? After cake and other sweet treats, we had time for some colouring and presents. Then parents started to turn up to collect their kiddos. 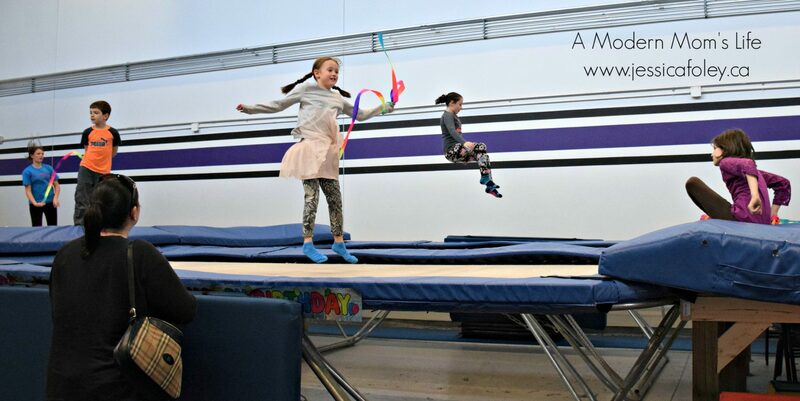 I was actually surprised at the amount of kids who had been to Kingston Aeros before – and those who were interested in having parties of their own. I would highly recommend throwing a party with Melinda at Kingston Aeros. They did all the clean up while we did gifts, and we were able to relax – as much as 10 kids and a few hangers-on parents allow! Sounds like a great time had by all, what a fantastic idea!! It was a ton of fun. Thanks Dar! Hi Jess, what a fun idea for a Birthday party (just so long as the cake eating is saved until afterwards!) and perfect for tiring the little darlings out too. I like the way Melinda took the time to warm up the children too, it would be so easy not to bother. Hey Deb! Yes, it was a lot of fun. The trampoline people purposely plan the food time at the end! It was well structured and I think everyone enjoyed themselves. Thanks for the comment! Oh wow! That looks like fantastic fun! It sounds like everyone had a great time! I think everyone did have a good time Kim. I know I did! 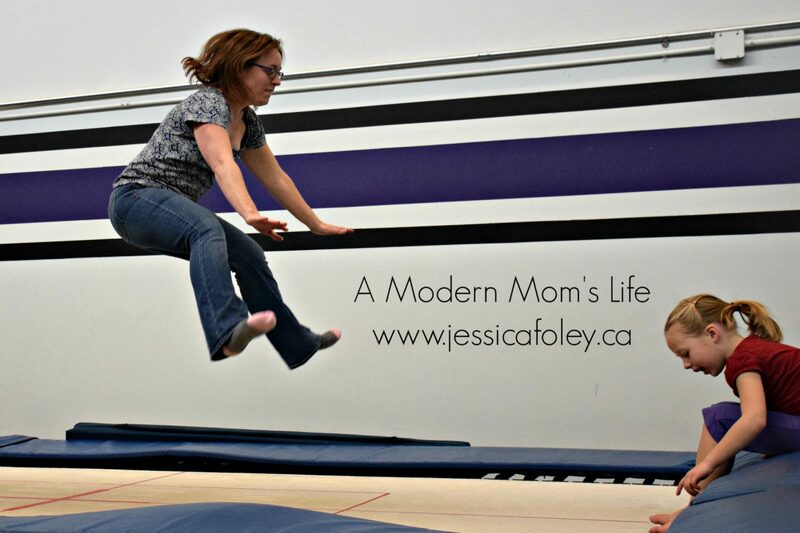 It was also fun trying to get some good photos of kids hovering over the trampolines. Thanks for the comment! I also love when parties wear out my kids. I didn’t get a lot of feedback from parents but all the kids said they had a great time. Thanks for the comment Lisa! This looks like so much fun! We have a Sky Zone near us and the kids have gone to several birthday parties there. I think they could probably stay there for the whole day and not get tired. Looks like everyone had a great time! They loved it – thanks for the comment Iveth! We were joking that we should have a grown-ups only party on the trampolines. The people who run the place said “bring it on!” It would be so much fun. Happy to join your linky Su! Thanks Mary! I think I got a photo of all the kids in the “levitating” stage. They loved Melinda bouncing them up to be caught. I think it was the highlight of the whole day! 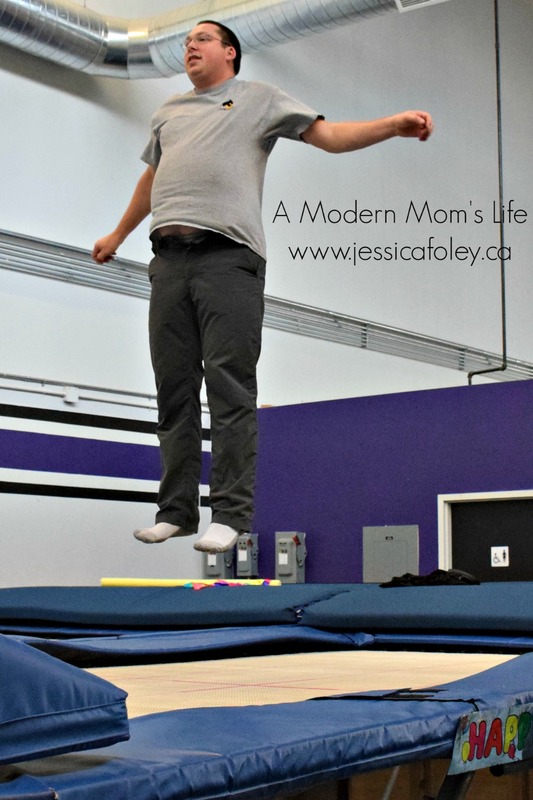 I was surprised at how much work it is jumping around on the trampolines. I was exhausted that night! But we did have fun.